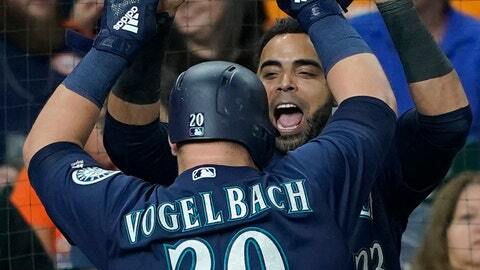 HOUSTON (AP) — When Houston’s Jake Marisnick made a highlight-reel catch on a ball hit by Robinson Cano for the second out of the eighth inning Monday night, Seattle manager Scott Servais started to think it just might not be his team’s night. The Mariners trailed 1-0 when Nelson Cruz singled off Hector Rondon (2-5) with no outs in the eighth, and Kyle Seager singled with one out. Cano then hit a ball into shallow center field that looked like it would drop, but Marisnick, who also made a nice grab for the inning’s first out, sprinted before diving and extending his arm to make the catch. It was the third pinch-hit grand slam in Mariners’ history and the first since Franklin Gutierrez hit one on July 21, 2015 at Detroit. The loss cut Houston’s lead in the AL West to four games over Oakland, which was off Monday night. Marwin Gonzalez had an RBI double to give the Astros the lead in the fourth. But they couldn’t muster much else on a night they managed just three hits, with the last one coming in the fifth. Houston’s Framber Valdez walked five but gave up just two hits in five innings. Rondon allowed four hits and four runs for his second straight loss after giving up three hits and two runs in 1 1/3 innings of a loss to Arizona on Friday night. LeBlanc walked a batter in both the first and second innings but didn’t allow a hit until Yuli Gurriel doubled with two outs in the fourth. Gonzalez followed with his double, which bounced off the wall in left center, to score Gurriel and make it 1-0. Mariners: LHP James Paxton rejoined the team Monday after resting at home for a few days after being diagnosed with pneumonia. He said he had a fever of as high as 104 degrees and it was the sickest he could ever remember being. He’s feeling much better now but is still a little week and lacking energy. He’ll try to throw a bullpen session either Tuesday or Wednesday but isn’t sure when he’ll feel good enough to rejoin the rotation. The Astros will push back Gerrit Cole’s scheduled start until Friday and start rookie Josh James (0-0, 4.22 ERA) in the second game of the series on Tuesday night. Hinch said they wanted to give Cole a little extra rest before his next start as his innings have started to pile up. The flame-throwing James has made two appearances out of the bullpen since making his major league debut in a start on Sept. 1. Mike Leake (10-9, 3.99) will pitch for Seattle.